Alupa A. Clarke was born in Quebec City on April 4, 1986. As the second child of a mother from Beauport, Quebec, and a father from Vancouver, he is a quintessential Canadian. Clarke grew up in New Brunswick before spending several years overseas. After graduating from high school, he returned to Canada. But by the age of 15, Clarke had already heard the call of public service, so he decided to devote himself to the well-being of his country and its citizens. As a young man, Clarke completed a master’s degree in political science at Laval University, writing a thesis on constitutional theories of the judicialization of politics. At the same time, he followed the family tradition of serving in the military as part of the 6th Field Artillery Regiment, based in Lévis, Quebec. Clarke’s political involvement began in 2007, when he joined the Conservative Party of Canada. Clarke spent eight years as an active member of the Conservative Party before being elected as a Member of Parliament. 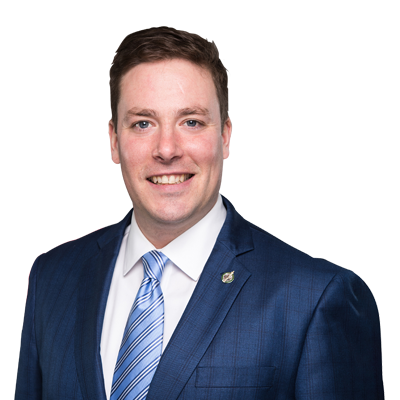 In addition to taking part in various election campaigns and numerous party events, Clarke was president of the Laval University Conservative association from 2013 to 2014 and president of the Beauport–Limoilou Conservative riding association in 2013. Finally, in 2013 he completed a prestigious internship with the issues management team in the Office of the Prime Minister Canada. In the 2015 general election, following a long campaign during which he knocked on over 20,000 doors, Clarke was elected the MP for Beauport–Limoilou. Soon after, the Honourable Rona Ambrose named him Official Opposition critic for veterans affairs (2015–2016) and, later, Official Opposition critic for public services and procurement (2016–2017). Clarke’s parliamentary duties included sitting on the Standing Committee on Veterans Affairs (ACVA) and the Standing Committee on Government Operations and Estimates (OGGO). In 2017, the new Conservative Leader, the Honourable Andrew Scheer, appointed Clarke Shadow Cabinet Secretary for Official Languages and La Francophonie, and since September 2018, he serves as Deputy Shadow Minister for Small Business and Export Promotion, Official Languages and la Francophonie. Clarke currently sits on the Standing Committee on Official Languages as Vice-Chair. Clarke loves to keep in touch with his riding and makes sure to meet with his constituents on a regular basis, including by doing his trademark door-knocking. Last but not least, Clarke is married and a father of two. He lives in Beauport with his wife, son and daughter.